Ok. This blog is on a phased-retirement / hiatus but we had to write a bit about this - A Henderson's Relish beer!!! What the actual? Wow. Relish is an essential condiment in our house ever since moving to the Steel City a decade or so back. If we run out, it's a minor disaster on a par with running out of (Yorkshire) tea bags or loo roll. So a beer. With Hendo's. I relished (sorry) the chance to try it as it was selling out like hot cakes around Sheffield. (I grabbed mine from the excellent Dronfield Beer Stop btw). A Bloody Mary porter. Makes sense. Not too heavy on the lactose, thankfully, with a subtle but long-lasting ancho chilli and szeuchan pepper kick that is pleasant and warming for sure. I liked it but got very little Henderson's Relish from it so I added a bit more myself, which worked pretty well. I was slightly surprised that there was no mention of salt or celery in the ingredients as I'd largely attributed them to the alleged hangover cure powers of a Bloody Mary. No horseradish either. hmm. Did we like it? Yes. A good beer made by a very capable brewery that is reasonably faithful to the cocktail that inspired it. 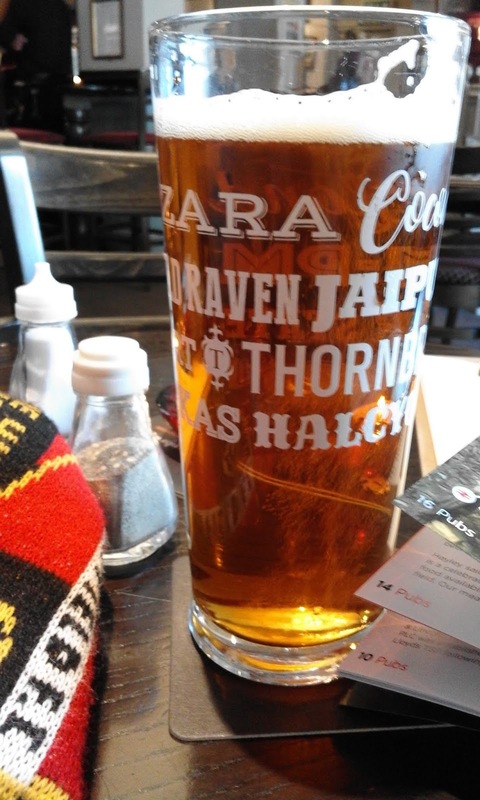 However, correct me if I`m wrong, it is made by Northern Monk in Leeds!!!!! Massive miss by our 20 odd Sheffield breweries and another major coup for Leeds. Scandalous. 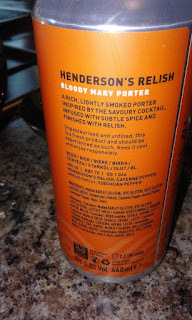 On the other hand, it's a shame that Henderson's themselves didn't insist on brewing the beer in our city but the sales of this novelty beer will be high no doubt. Next up, a Worcestershire sauce pale ale brewed in Hereford. Tut, tut. 1. Shakespeares- Retains top spot. Many great events, consistent quality ale at Sheff-friendly prices with enthusiastic, expert leadership. A butty for < £1. Close but winner by a head or so. Cheers!! 2. Rutland Arms (Up 1! )- amazing beer (and food!) and inventive events aplenty. Super soild leadership and staff much-improved. On the up, still. 3. The Bar Stewards (NEW!) 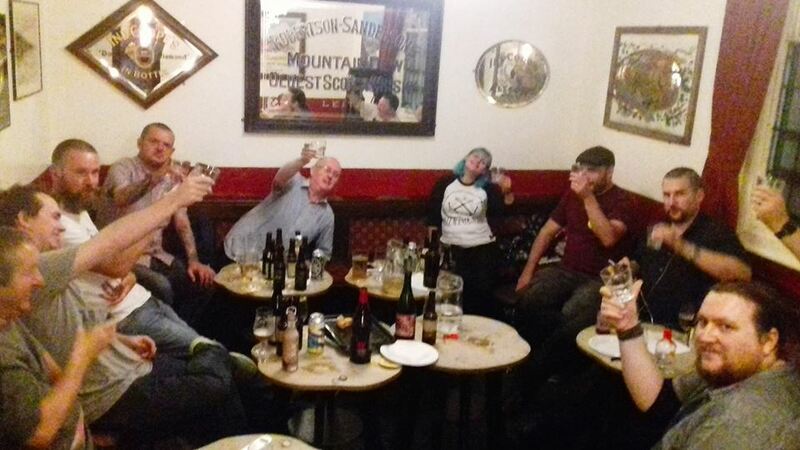 - it took us a while to warm to this place but we`d now call it as the city`s finest micro-pub. Small in stature but punches well above its weight now under the esteemed daily leadership of Jase Kerr. 4. The Beer Engine - a great spot for the discerning drinker. Now added fire power with even more keg lines! Quality. And food, and still below the radar of many visitors. 5. The Wellington (NEW!) - THE transformation on Shalesmoor! 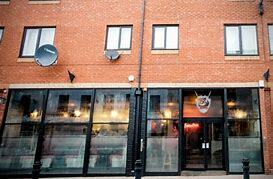 Beautiful considered refurb with plenty of tasty beer, always including Neepsend`s newest offerings and a back bar. Great work. 6. The Sheaf View (DOWN 1) - Super reliable. The pub for all people in all seasons. Dan`s local. 7. The White Lion (DOWN 1) - Beautiful boozer offering a reyt ale experience. Cornerstone of the `vegan quarter` with proper pizza next door and other offerings so close too! 8. The Beer House (DOWN 1) - a lovely place to refuel after a stroll on Eccy Road or a play in Endcliffe Park..
9. The Broadfield - always attentive staff, lush interior and another strong year on the beer front. 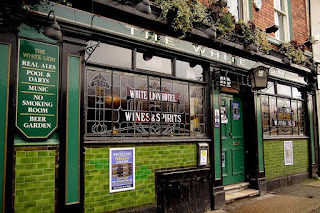 Truly TN`s best boozer, although Waggon deserves a mention too! Both have beer AND food! 10. 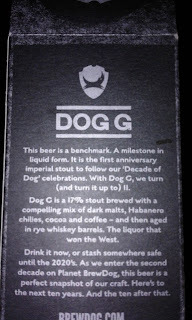 Brewdog (NEW!) - been lurking for a good while but 2018 has been a decent one on Div Street to say the least. A big step up with the top takeovers and Tramlines at Brewdog was INSANE. Bossman Matt must be mega proud! So, two of the Birkett portfolio in our selection but none from Thornbridge again this time. Most intriguing will be the Kelham Island Tavern - a few barbs aimed at 2BGs in the past but new custodians and so we look forward to seeing the KIT in it`s 21st century guise. Also the usual footnote that we tend to drink in South West Sheff plus the city centre with occasional wander to the Kelham Island area so there are a few contenders that we rarely visit TBH. Shout up and we`ll endeavour to visit soon! OK. So this is impossible really. 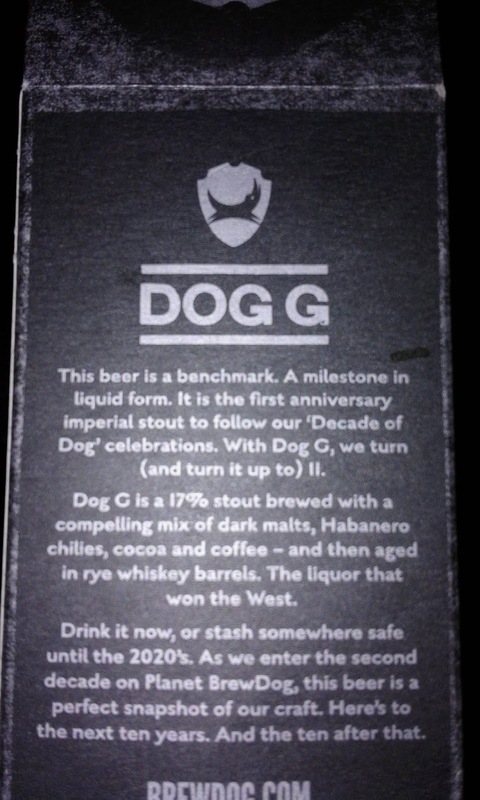 Last year, we didn't even try but, this year, we have a little list of memorable beers. No winners, just lots of admirable ales. We believe that beers can be situational and subjective; if that fourth pint of Magnet after a point away at Oakwell was your best then... that's fine. Imperial Cherry Stout - Marble . A Winter beer supped at a Summer bottle share but still epic. Limited edition too. Deep and rewarding. 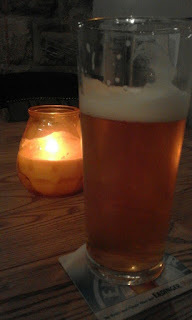 Green Path IPA by Burnt Mill at The Broadfield. This Sussex, possibly Suffolk, brewery do occasionally appear at select spots around the Steel City. Tidy tackle. Trust. Divine Elements by Black Iris. Again, this was possibly at the Broady too. Great beers these days, this Derby collective have moved up many a gear over the past 18 months or so. The Green Tea one - Abbeydale and the Birdhouse Tea Company. Summer supping. Refreshing and beautifully balanced. A meeting of marvellous minds, we think. Also, along the same lines, Gunnamatta from Yeastie Boys. A stronger brew, 6.6% from Berkshire. Loopaloosa - by Neepsend Brewey at Bar Stewards and the Sheaf View and Steel City CAMRA festival. OK, we can`t really recall what it was called but it was one of the very finest beers from over 100 already produced by Neepsend at Neepsend. Award-winning ale from one of our own, we've enjoyed it on keg and cask . Great job. Brut IPA by Almasty at the Steel City fest. One of 2018's break-through brewers at another fantastic Sheffield CAMRA beer festival. We both like this new style but, between Dan and Wee Beefy, this cask didn't last long. Abbeydale do a decent Brut too fwiw - Splash It! Pressure Drop`s Mimic - was also a moment to remember at Kelham Island museum. Sounds of Islay - Buxton from their Cellar bar. Big and smoky. Nice place (small and not smoky). We loved Buxton`s Cranachan this year too. 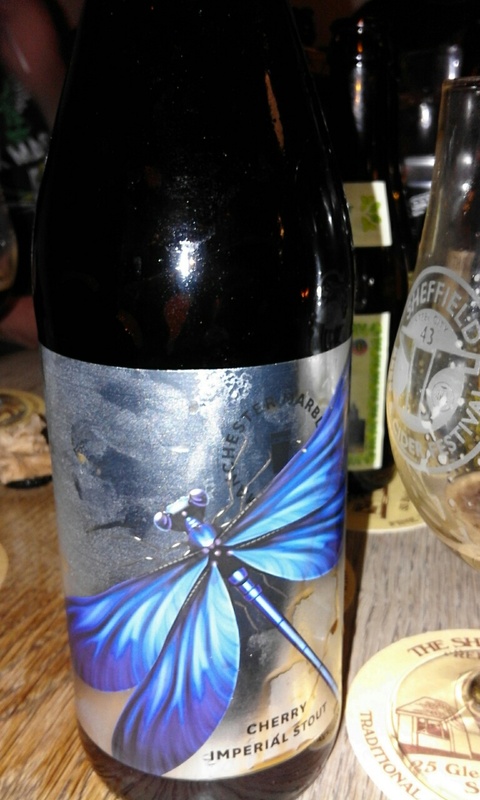 Many supped and a glorious result when Danny took this to a Beer Central bottle share. Winner! So, with no further ado, in fact no do at all, we are pleased to announce our Best Brewery of 2018 as ……. Torrside Brewing! 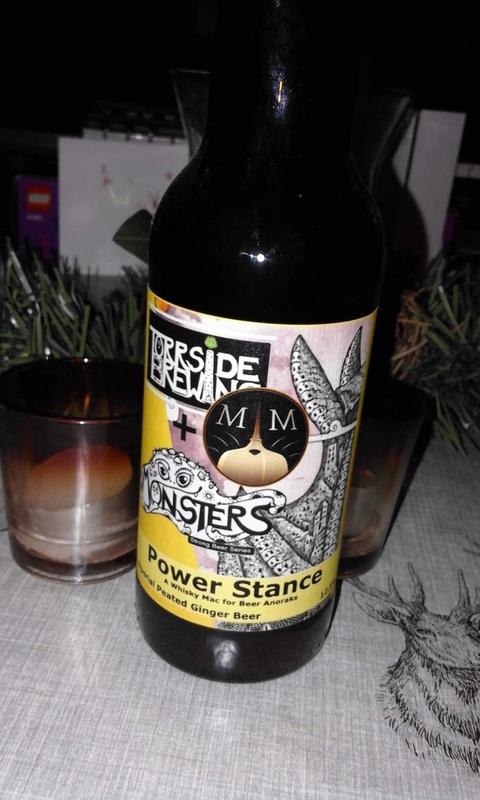 Following in the footsteps of previous winners Neepsend, Hop Jacker, Lost Industry and last year's victors Abbeydale Brewery, Torrside have caught our eye with some monstrous efforts. OK , these guys aren' t quite as `local` as our previous winners but they're not too far away. Despite only being founded in 2015 as a home-brewing collective, this innovative New Mills` beery brains-trust are pushing boundaries and testing tastebuds . Us two are in agreement (for once!) that, just ahead of North Riding Brewery and ever-improving locals Abbeydale, Torrside deserve our accolade this time around. Core beers are solid but their Monsters series are absolutely (and appropriately!) out of this world! To be honest, some of them sound like they might not 'work' but they just do. Genius. And beyond! That won`t work! Will it?! (with Mashtun & Meow). All the ale with Beer Central. Marbleous. 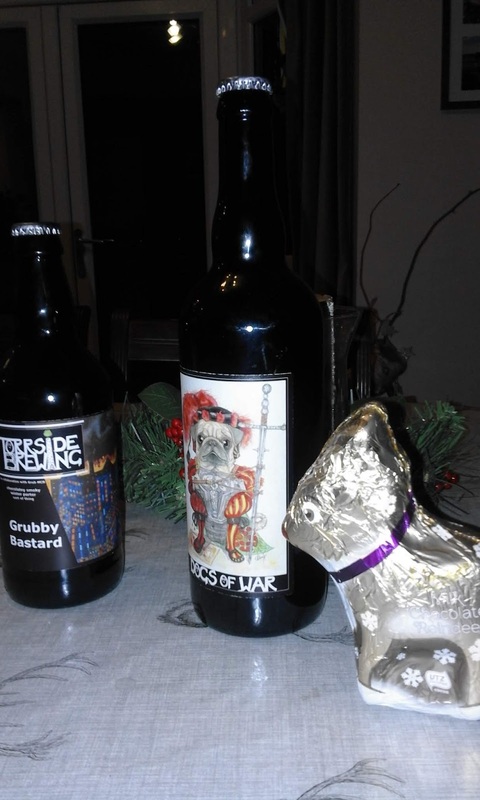 The artwork on the bottles is courtesy of Emma Sidwell (a part of the family , we believe - ? ), and certainly helps Torrside to stand out from the crowd. Keep an eye out for them! 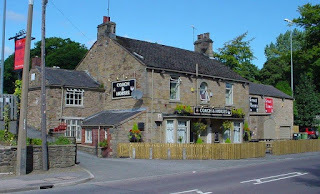 Look at local experts Beer Central, Hop Hideout and Dronfield Beer Stop for your best bet. Try a Torr - you won't be disappointed! And got these two lined up next!!!! Last year`s selection - HERE ! Jabeerwocky - Sheffield's first 'Dive Bar'. Last week, twobeergeeks were fortunate enough to be invited along to the opening of a new bar on London Road. Jabeerwocky has now replaced Bar Ambasada so what's it like? We chatted to Chris, who was previously at The Bath, about his new place. Well not a lot has changed inside and outside so far but the drinks offerings are much improved. Jabeerwocky are keen to keep their links to the local Polish community but also to widen appeal to others too. On the bar, we were pleased to see a range of four carefully selected keg ales in a range of styles, stout, IPA and weisse. Danny had some Dutty whilst I dived straight into the Buxton Extra Stout, very apt on a chilly November night and suppable even at 7%+. Jabeerwocky also has a selection of bottled beers; crafty ones and Polish ones. Chris also stated that he was a fan of Poland's vodkas and so we felt obliged to sample - the hazelnut one is a cracker! The name sort of came to us - we were trying to think of something a bit different and fun. We were going to call it Jabberwocky Bar, based on the Lewis Carroll poem and film by Terry Gilliam. Then we thought as we planned to serve lots of different types of beer that 'Jabeerwocky' worked well. We are Chris and Abbi. Chris was the manager of the Bath Hotel before taking this on, having worked for 5 years for Thornbridge in their various pubs. Abbi previously worked at the Harlequin for several years a while back, and is part of Freak Street Cafe, a pop-up selling Himalayan dumplings - momos. The ethos of the place comes from our time travelling, mainly in Europe. We've spent a lot of time in 'dive bars' in Eastern Berlin, Madrid, Ruin Bars in Budapest and wanted to bring a taste of this to Sheffield. Basically a relaxed atmosphere, with good quality, interesting drinks, food & music. There are a lot of craft places in Sheffield, but we hope to bring something that is a little different from the rest - especially drawing on the bar's Polish & European connections. The couple we took the place from are Polish, and have been super helpful during the transition. The previous owners only wanted to sell to someone who would keep the location as a bar. There is a Polish community in the area, and most of them see this as their local so it`s really important to us to keep those links. Having been to Poland we knew that the lager and vodka is some of the best the Europe (in our opinion anyway) and the connections and contacts we were given by the previous owners meant we could have a range of Polish lagers in bottles, Tyskie on draught, and a selection of clear & flavoured Polish vodkas that would serve the Polish community, as well as bringing something different, and tasty! We will be having music an events, and are lucky to have a decent space to put music on. Bar Ambasada had been putting on semi-regular events, and we are looking to increase that, from live bands to a range of DJ and electronic music events that will go a little later into the evening. In particular, world music, techno & drum and bass. We want to bring some interesting music that`s a little different down here and are in talks with a couple of promoters to bring some nights in. Food will not be the main focus - we know there is too much competition around us for that. But we do want to offer homemade quality beer snacks. From hand-rolled dumplings, goulash, skewers of meat and veg to boozy brownies and Polish doughnuts. We are not here to be a restaurant, but a place were you can get some great snacks to go with your drinks. OMG - The vegan ones are epic! Our favourite beer this year we actually did have in Poland. 'Baribal' by Deer Bear brewery, is an imperial cinnamon waffle chilli maple stout! Sounds a lot of flavours in one, but each came to the fore while drinking it - it was especially good on draught, but at 11% not for everyday. Otherwise, Buxton Axe Edge is always a good shout, and easier to get here! (though we are looking to bring in some Polish and Eastern European craft beer to the bar in the near future). Our favorite drinking spots include: the Bath Hotel (Chris has spent a fair bit of time there! ), the Beer Engine, The Rutland and The Blake - but I could list many more! We are just starting up, so the range of beer and food will be growing. We are hoping to see some cask installed in the next couple of months, probably 1 or 2 lines to begin with, and you will start seeing more events and even a quiz happening down here. We found the bar to be quite cosy and there aren't many places locally where you can get good beer and play pool. Previously, Ambasada was a decent place to watch football but we're not sure if Jabeerwocky will retain this aspect. The location makes Jabeerwocky a nice addition to London Road, which was a real ale desert not so long back. Give it a try and let us know what you think! It's fair to say that there has long been a crossover between beer and football. Both can be an expensive business, truth be told. However, a growing number of discerning footy fans are becoming more selective about which pubs they visit pre-match. Gone are the days of piling off the train and falling into the nearest boozer (which was often a reyt dive near the station) or heading for nearest 'spoons. Many fans will plot trips as soon as the fixtures come out using the Good Beer Guide or seek online advice. Recently, I met up with Matty Banks who had the bright idea of forming a Twitter site and Facebook group called `Realale pubs Away days` which really has gone from strength to strength since he started it last year. We met up for his first visit to a Sheffield FC match at the Coach and Horses ground, Dronfield. The Home of Football. And beer. Q. Which team do you support? Doncaster Rovers. I am a season ticket holder. Q. Best pub in Donny? Now that Cask Corner has gone, the Corner Pin. Castle Rock. (And Matty spoke highly of our own New Barrack Tavern here). Q. Best city for pubs? Sheffield? Scunthorpe. Apart from the Honest Lawyer, it's terrible. That pub is great but miles from Glanford Park! Q. Future plans for RAPAD? Build the Facebook group by linking in with supporters' groups. Also I'm looking at some end of season awards for pubs. (Matty seemed really impressed with the Coach and Horses! "What a pub!" quoth the man himself). Sure enough, the match itself didn't disappoint! A massive 5-3 win for Sheffield Club over Pontefract Collieries accompanied by some splendid Thornbridge ales in the late Summer sunshine. Happy days! Two blokes who like beer, writing about the beer that they like.